This is an updated version of my Candy Cane Toothpaste recipe. The taste is not drastically different, but the dried elderberries at an extra touch of flavor and color. It is made the same way as the Candy Cane Toothpaste with a few minor adjustments. FIrst, simmer the following ingredients to make a very strong tea using 2 cups of distilled water (this will prolong the shelf life), 1/2 cup peppermint leaf (for taste and disinfecting purposes), a bit of stevia leaf (to sweeten – doesn’t take much – 1 tsp. or less), and 1/8 cup dried elderberries,. Strain the dried herbs and reduce the liquid to about 1/2 cup. Mix your tea into bentonite clay with a popsicle stick (do not use metal utensils) until desired texture is achieved. To prolong the shelf life and add a little taste, add one drop of peppermint oil (take care not to add more than that or it may be too strong). 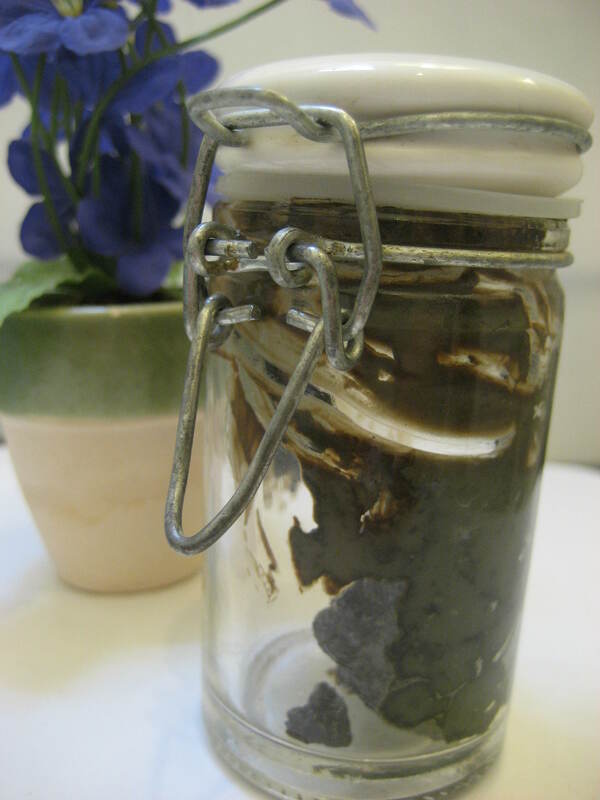 Store the mixture in glass jar (as pictured above) and apply to toothbrush with a popsicle stick. This mixture should last about 3 months at room temperature. This entry was posted in Body, Homemade Products, Kids, Medicine Cabinet, Recipes, Remedies. Bookmark the permalink.